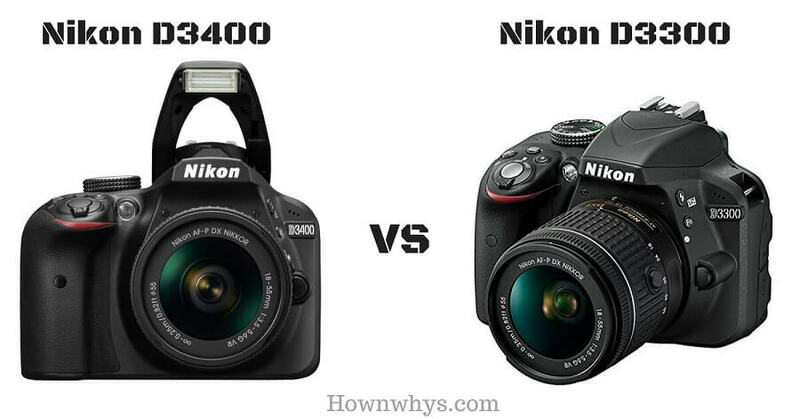 Home / entertainment / Nikon D3400 vs D3300 - Which Is Perfect For You And Why? Buying a camera has never been easier-it’s hard to get one that would take decent pictures without a lot of effort. But buying the right camera still takes some doing. Ultimately there are a lot of things to consider, and a lot of numbers to ignore, but the key is to figure out what kind of photographer you are. It’s certainly true that the best camera is the one you have with you. 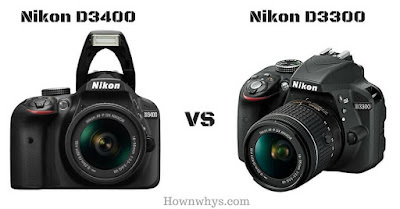 But the best photos come from having the right camera with you, and so here we are comparing two DSLR cameras: Nikon D3400 vs D3300. Nikon is the name trusted by millions of photographers around the world. With the cutting-edge innovations and relentless pursuit of quality, they serve as the global leader in digital imaging and optics. Each camera in the D3000 line has proved popular, but how do Nikon’s two most junior DSLRs stand up against each other? And should 2014s D3300 users be upgrading to 2016s D3400 model? If you are wondering there is going to be a big difference between the photos that these cameras take, the answer is NO. On a technical level, you have exactly the same possibilities with both cameras. They have the same processors, the same sensor, the same shutter speed and the same ISO range. Video quality also isn’t improved; it remains full HD. They both feel the same, smell the same, taste the same... and yet they are different in their own aspects. 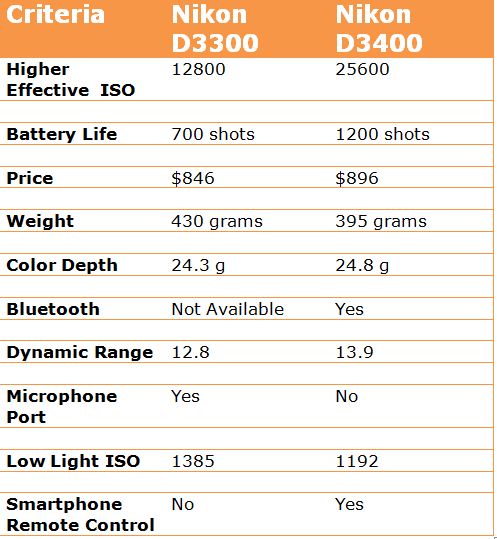 The detailed comparison of all the specifications. Also Read: Polaroid Zip vs HP Sprocket: Which One Should You Buy? In most respects, the Nikon D3400 has the same features as its predecessor. Apart from some slight exterior styling changes, the new model has the same or a related 24-Mpix APS-C CMOS sensor without OLPF; however, its EXPEED 4 processor has a new top ISO value of 25600, up against a stop from 12800. Adjustments to the processor have also resulted in extended battery life and improved recording of Full HD (1080/60p) videos; however, the frame rate options and 5 fps continuous shooting for stills remain unchanged. It also uses the same Multi-CAM 1000, 11-point AF system focus and 3.0-inch LCD at the rear; however, the D3400 adopts Nikon’s SnapBridge feature that allows 2-Mpix stills to be transferred wirelessly to a smart device using built-in Bluetooth Low Energy (BLE) technology. You can also use SnapBridge to tag the images with GPS coordinates from the smart device, without going to the additional expense of buying adapters. Also Read: Canon Selphy CP910 vs CP1200: Which Should You Consider? The sensor size, resolution, ISO range and image processor of both the camera are identical, hence both the camera will give same image quality. Let's talk about the new innovations of D3400 and a detailed comparison between both the cameras. The first and the most important innovation is integrated Bluetooth connectivity and compatibility with Nikon Snapbridge platform, thanks to which we can share pictures we take instantly with our smartphone and upload them to Instagram, Facebook, Twitter, etc. It’s a feature we expected, only because more and more users are sharing their pictures, and this can be a deciding factor if you’re someone that uses social media a lot. Battery life is another major improvement. So much that it is almost confirmed that it can take as many as twice the amount of pictures the Nikon D3300 can, on a single charge. It can take up to 1,200 pictures on one charge, compared to 700 on the Nikon D3300. Of course, if we are using Bluetooth, battery life will decrease, but if we only use it for taking photographs, it will give us better battery life and will allow us to forget about carrying an extra battery. The Nikon D3400 will cost you $100 extra, I don’t get any logical reason to spend $100 extra cash on a camera that features the same specification. I recommend you to get Nikon D3300 combo pack (B&H) that includes a zoom lens and a camera travel bag will cost you bit higher than the Nikon D3300. The D3400 actually got rid of a few really key things. One is the audio input port which is gone on the D3400. The D3300 has it so you can attach better external microphones for better audio. Secondly, the D3400 got rid of the micro cleaning feature. This is just a small thing which shakes the sensor a bit to remove dust if there was any on the sensor, the D3300 has this. Weight is another important factor, especially when deciding on a camera that you want to carry with you all day. Nikon D3400 is 35g lighter than the Nikon D3300 but we don't think this will make a significant difference. The Nikon D3400 measures the same as its predecessor (4.9 x 3.9 x 3.0” / 124.0 x 98 x 75.5mm), but weighs slightly less at 13.93 oz. / 395g, body-only (without battery or card). It is available now with the new AF-P 18-55mm VR kit lens at around $649 (USD). Also, keep in mind that body weight is not the only deciding factor when comparing two interchangeable camera bodies, you have to also take into account the lenses that you will be using with these bodies. Since both Nikon D3400 and Nikon D3300 have the same APS-C sized sensor, their lenses for a similar focal length and aperture will be similar in size and weight. Overall, the camera of D3300 delivers very good photo and video quality for its price. Thanks to its new sensor -- the same resolution as the D3300, but without an anti-aliasing filter to slightly unsharpen the image -- the D3400 delivers slightly sharper photos in low light than its predecessor. They don't seem to have a better tonal range in shadows and highlights than before, but the extra sharpness makes a difference. So what is the bottom line? Is the Nikon D3300 better than the Nikon D3400 or vice versa? The only noticeable difference is the introduction of a new battery that can capture 1200 shots in a single Recharge whereas the battery of Nikon D3300 camera was limited to 700 shots in a single Recharge. The Other noticeable difference is Nikon D3400 is bit lightweight and an introduction of Snap Bridge in Nikon D3400 camera that will include more options to the user for sharing his image wirelessly with the help of a WiFi network. But in addition to the last two features, it’s also lighter. Specifically, it weighs less than 400 grams, while the Nikon D3300 weighs less than 500 grams. The difference is about 100 grams, about 20% of the weight of the camera, which is very noticeable. It’s already a light DSLR camera as it is, but now it’s even more. However, there are also some reasons you would prefer the Nikon D3300. For example, given the fact that you’re going to be able to get the same quality photographs with the D3300 and D3400. If what you’re looking for is a quality camera, it maybe wouldn’t be worth it to spend the extra money for the D3400, which is about 100 dollars more, or even more if you can get a deal on the D3300. If you truly want to step into the world of photography, and this is going to be your first camera, you need to know that post-processing is present in every photo. If you are an owner of Nikon D3300 camera we recommend you to hold your purchase hand don’t buy the recently announced Nikon D3400 camera since the camera doesn’t have sufficient amount of upgrades and its Core specification remains identical to its predecessor except minor changes. But if its your first DSLR then you must go with Nikon D3400 as it includes all the features of an entry level camera as well as a wonderful battery. The important thing is that you’ll be able to achieve the same picture quality with both cameras. And as long as you’re able to purchase the D3300 for a somewhat lower price than the D3400, it will still be the best option, in my opinion. Of course, the time will come when the D3300 will be out of stock, and the D3400 will be the only available one for purchase, or its price will decrease to almost the same price as the D3300. In that case, the choice couldn’t be clearer. But for now, I think the D3300 remains a great option for the high quality it offers. An entry-level camera, capable of achieving fantastic photos. nice and very useful info.thank dear for sharing..